Here are my attempts at completing the classic tick list books. This is the tick list for the climber in the lower grades (< VS). Perhaps not as important as Hard Rock but it is the best seller in the series, other than the walking books. Perhaps as an acknowledgement to this the book includes a list of alternative routes to the main list to try and spread the load a bit. The picture shows the 2007 edition. The original book in the series. 60 Classic climbs across the length and breadth of Britain. It has stood the time well since its original publication. 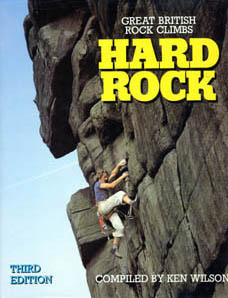 The picture shows the cover of the third print run. A bit of a collectors item this as the original plates have apparently been lost so no reprints are possible. Whereas Hard Rock dealt with the limit of what was felt achievable in the 1970s, this book deals with the explosion in standards through the 1980s. From the hard bold traditional climbs of Scotland, The Lakes and North Wales to the early bolt protected routes at Malham and Ravens Tor, the state of the late ’80s art is here. 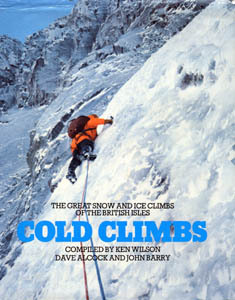 A book written for the afficionado of the white stuff. The book may appear dated, especially as it appeared before the explosion in popularity of mixed routes but completing all the routes here has so far eluded the most keen. Eloquent descriptions of 100 routes from easy to fairly hard (in the modern scheme of things), the idea being to induct the reader, of course will climb each course, into the greater game of alpinism. Climate change and rockfall have altered many of the routes (some such as the Bonatti Pillar have all but disappeared) but the idea is sound. The inspiration for the first four books above. 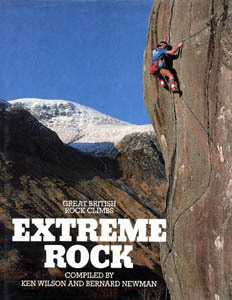 One hundred well known and not so well known (to the UK climber) rock climbs in the alps. Everything from the Central Pillar of Frêney to hidden gems in the Karwendal.